Bill Spindle is the Vice President for Business Affairs and CFO. 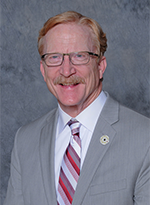 His responsibilities include Comptroller and Treasury Services, Student Finances, HR, IT, UPD, Procurement, Auxiliary Services, Facilities Services, Compliance, Property, Food Services, Environmental Safety and Health, and Mail Services. He started in the position in October of 2016. Previously, he was the Vice Chancellor for Administrative Services at the University of Alaska Anchorage (UAA). He was in that position for nine years. Before that, he was also the Director of the Auxiliary Services at UAA for eight years. His initial positions in the University of Alaska system were as the Deputy Chief Procurement Officer and then the Chief Procurement Officer. Before his time at Texas A&M – San Antonio and the University of Alaska, Bill was a career Air Force officer, spending most of his time in the Contracting and Logistics arena and retiring as a Colonel. Bill also has a long history as an adjunct professor. He has a Doctorate in Educational Leadership and a MBA, and has taught many university classes in business and management.